"Zorro" who fights against injustice and is the defender of the poor, is not just a re-creation of the old, but takes the classic spirit of this character into a new generation. Don Diego will not be portrayed as a "fop and dandy," but as an educated man, well versed in both the arts and sciences, who uses his knowledge to solve the problems he faces in his adventures. In contrast to the earlier series, Zorro will now have a continuing love interest portrayed by Patrice Camhi, a beautiful Señorita attracted to the dashing Zorro, but not to Zorro's alter ego self, Don Diego. 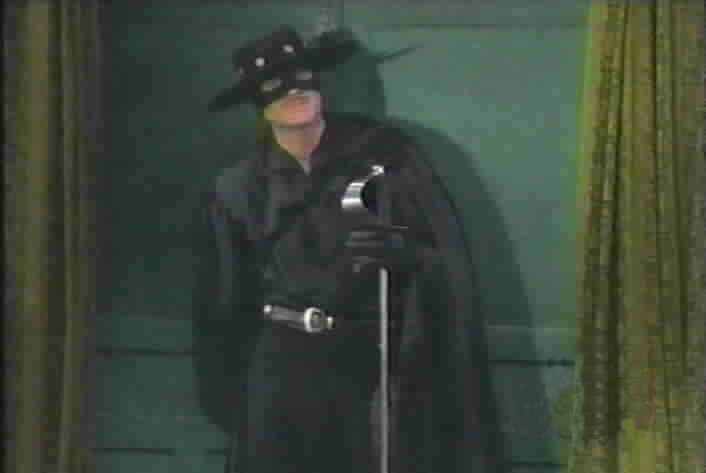 Another character twist will be Zorro's sidekick, who was portrayed as a middle aged deaf mute in the original series. Now the sidekick will be a mute young man, played by Juan Diego Botto, who can hear but is thought by all to be deaf. Executive Producers Goodman and Rosen note that "the plots of the episodes, while still filled with the kind of swashbuckling adventure that is the hallmark of the Zorro legend, will also historically mirror actual problems that plagued the pueblo of Los Angeles in the early 1800's. These include drought, earthquakes, and municipal corruption." Watching the shows in order by production number is quite interesting since it clearly shows the development of the series into what it ultimately becomes. I firmly believe that the episodes were filmed in the order that the production numbers indicate. During the earliest episodes, Zorro lacks some of his charisma, the characters' personalities are not as well-defined as they later become, and the storylines are not as compelling as later episodes. However, the earliest episodes do have one quality that I have loved about this series ever since I watched it for the first time: the delightful fencing scenes accompanied by an instrumental version of the theme music playing in the background. This episode list includes special notes about each episode. Notice that in several instances, episodes with consecutive production numbers use similar plot devices, which supports my belief about the filming order. Additionally, the episodes with the earliest production numbers seem to be the most uneven as to the personalities of the characters. The actors were still developing their portrayals of the characters. #B89101 "Dead Men Tell No Tales"
The opening credits have different pictures than the rest of the 1st season, and the music is sung by a man. Felipe is referred to by Victoria as "a servant of the De la Vegas. He is a deaf-mute." This is the only time in the entire series that Felipe is referred to as a servant. Two shots are fired into the Alcalde's door, leaving two holes in the door. This is notable as the patched holes are visible in later episodes. Science: Zorro uses a telescopic lens to create a fire. Regehr's facial expressions and mannerisms as Zorro seem a bit overdone and rather mimic those of Guy Williams. He is trying to feel his way into the character. "How perceptive of you. He and I have been in correspondence for many months." "Excellent! All of Diamante's moves. However, the art of swordplay cannot effectively be taught," Zorro disarms the Alcalde, "through the mail." The visiting writer, Moreno, is the first person who probably guesses Zorro's identity. Science: Zorro uses time-delay fuses to distract the Alcalde and his men. Criticism: Diego's attempt at photography results in an explosion that Don Alejandro hears. Don Alejandro doesn't question Diego's story about slamming down a piano lid in frustration; additionally, he doesn't smell the smoke. Zorro kisses Victoria's hand for the first time. The attraction between Victoria and Zorro is made more apparent than in the first two episodes. Criticism: Victoria childishly gets into a food-fight with another woman who expresses interest in Zorro. Diego is shown painting, which reveals that he is an artist. Diego has painted a portrait that looks just like Victoria. Felipe is shown to be a restless teenager during a scene in the cave. Diego appears to be annoyed by his behavior. During much of the show, the weather is overcast, cloudy, and foggy. Science: Diego creates a fake gemstone to fool the Alcalde. Criticism: Victoria makes a comment that seems unintelligent and out of character. "Why would Don Alejandro risk his life for the Alcalde's payroll?" Diego responds, "He wasn't helping the Alcalde. He was helping a man in trouble." Victoria should have understood since she knows why Zorro does what he does. Victoria also tries to discourage Diego from speaking to his unconscious father, saying that Don Alejandro could not hear him; what difference did it make to her? Sgt. Mendoza has to explain to the alcalde about Zorro's mark, as if the alcalde didn't already know. "We did not even find his mark." "Yes, the Z. He never shoots us or hurts us. He just humiliates us by leaving his signature behind." #B89107 "A Wolf in Sheep's Clothing"
We learn that Diego enjoys bird-watching, a hobby that he shares with the new padre. This episode marks the first appearance of Padre Benitez. In this episode, Diego makes a bust of himself, indicating his interest in sculpting. Don Alejandro's behavior during this epsisode is a bit silly. Diego is placed in jail for speaking against the alcalde. Science: Zorro uses a smoke bomb to scare Mendoza and uses chemicals to compare the source of the alcalde's water and the plaza's water. Note: Felipe covers his ears when he sets off some firecrackers. This incident is the first hint to the viewer that Felipe can actually hear. Science: Diego uses wine to show how a bird can be made to appear dead and a stimulant to show how it can be awakened. Zorro is shown without his hat. #B89112 "A Deal with the Devil"
A car can be seen in the background as Sgt. Mendoza goes to meet Colonel Palomarez during the first minute of the show. During this episode is the only time Zorro is ever placed in jail. Science: Zorro uses gunpowder placed on the ends of arrows to create explosions. 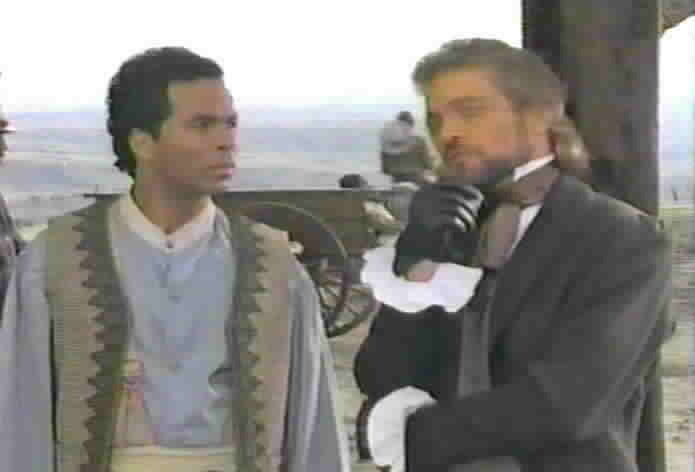 Zorro is unmasked during this episode, except that the man behind the mask turns out to be an imposter. It is revealed that Sgt. Mendoza is an orphan. This episode is the only one in the 1st season in which a Z is cut leading into each commercial break. This episode contains an editing flaw in which Diego's suit is blue inside the cave and is brown when he emerges. Science: Zorro uses a voice distortion device. This episode is the only one which gives us any information about Diego's mother. It is once again mentioned that Sgt. Mendoza is an orphan. Science: The medium's accomplice uses a voice distortion device. It is cloudy, overcast, and cold during this episode. 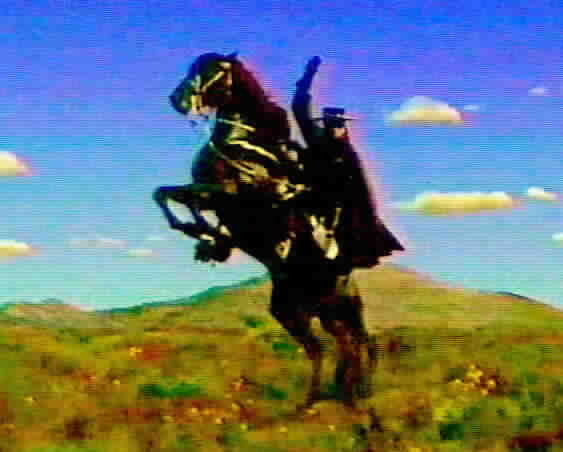 Zorro's breath can be seen in the alcalde's office near the end of show. Zorro kisses Victoria's hand when he speaks to her in the tavern. Zorro is seen without his hat. Science: Diego knows that the land grant is printed on parchment which is too porous and must be from South America. Patrice Martinez's brother Benito guest stars in this episode. #B89119 "Pride of the Pueblo"
Science: Ether is placed on Sgt. Mendoza's boxing gloves to help him knock out his opponent. The weather is overcast and foggy during much of the show. It rains at one point during the show. It is cold since the breath of the horses and people is visible during much of the show. Victoria finds roses from Zorro on her pillow. Hunter Tylo, the wife of Michael Tylo, guest stars. The weather is cloudy, overcast, and cold during much of this episode. Zorro kisses Victoria's hand two different times during this episode. It is finally revealed that Felipe is only mute and not deaf. Zorro is shown without a hat. The first appearance of Diego's fight master, Sir Edmund Kendall. Sir Edmund is played by Peter Diamond, the stunt coordinator for this series. Diamond makes a second and final appearance as Kendall in the 2nd season episode "Master and Pupil." This episode has a scene which mimics a scene from The Mark of Zorro (1940) during which Zorro and Sgt. Mendoza try to impress each other by slicing candles with their swords. During this episode, Victoria dreams that she kisses Zorro. Page design and original content copyright © 2002-2003 by Jennifer White, All Rights Reserved.